I spent time putting together the Understanding Gauge correspondence course. It will be more comprehensive than the course I could offer at conferences since the students have more time. The first lesson will be about how to knit gauge swatches and calculate gauge (also covered in the Basics course) but it will it include how to use gauge information when working with patterns. The gauge information in the Basics Class is designed to help prepare students for the Masters program. The gauge course is more about using gauge in actual projects. Lesson 2 covers how to use gauge information to alter patterns (use a different weight of yarn, change necklines, etc.) Lesson 3 will cover how to use gauge to design garments. I am having a lot of fun putting this together. The course will be available on October 15th. Things are back to normal. I received quite a few lessons to review. Generally more Lesson 1 swatches arrive. This week most were Lesson 2. It makes me happy to see students progressing through the course. 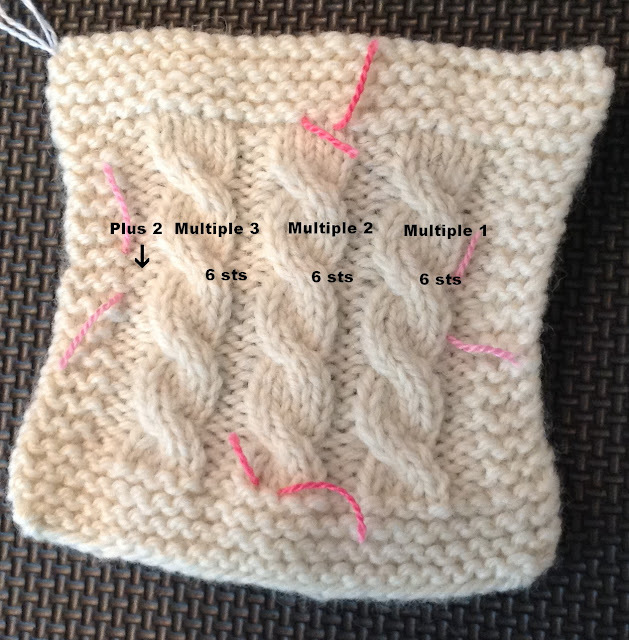 The "Multiple" is the number of stitches it takes to complete the pattern once. The "Plus" number of stitches is the number of stitches you need to balance or complete the pattern if you are working it flat. In the example below, three multiples of the stitch pattern have been worked. Each multiple is made up of 6 stitches, 4 stitches for the cable and 2 stitches for the reverse stockinette between the cables. To balance and complete the pattern on the left side of the swatch there are 2 additional stitches for the reverse stockinette stitches. 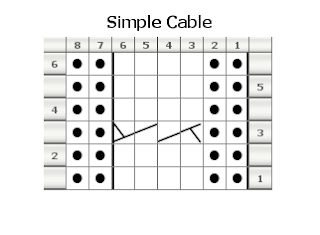 If I were going to use this stitch pattern in a swatch knitted flat and I needed to determine how many stitches to cast on, I would multiply the number of cables I want (3) by the multiple number (6). This gives me 18 stitches. I then would add the "Plus 2" which gives me 20. If I wanted a border (as shown in the photograph) I would then add those stitches. The "Plus" stitch in this stitch pattern would be ignored if you were working this pattern in the round. If you included the "Plus 2" There would be 4 reverse stockinette stitches between the first and last cables. In the photograph which follows , the lace pattern is a multiple of 8 plus 1. Each 7 stitch lace motif is separated by a single reverse stockinette stitch. 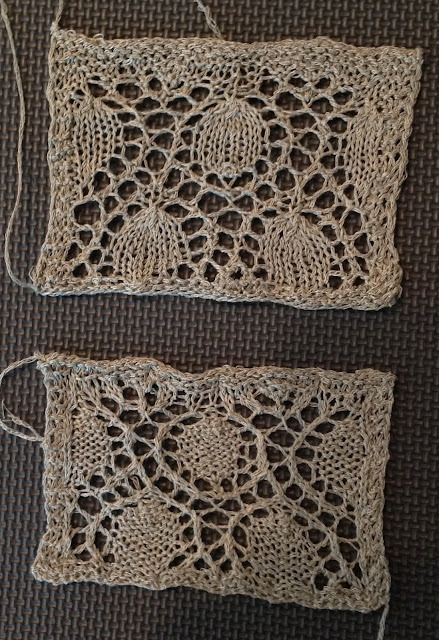 If I were casting on stitches for this swatch I would need 24 (8 stitches multiplied by 3 (the number of lace motifs I want). I would then add the "Plus 1" for a total of 25. If I wanted the border, I would need 6 more stitches. In the Masters Program we use "Repeats" to indicate the the number of times you work the rows of a stitch pattern. I think the confusion comes from the word itself. As a noun, it identifies a specific thing. As a verb it can be used in a variety of ways. For example, "I am going to repeat the multiple 3 times." Row 1 & 3: *P2, k4; rep from * to last 2 sts, p2. Row 2 and all even rows: *K2, p4; rep from * to last 2 sts. Row 5: *P2, C4F; rep from * to last 2 sts, p2. This pattern has a Repeat of 6 rows. If I were writing a pattern for this swatch I would tell the knitter to repeat Rows 1-6 four times. You may want to think of the Multiples as giving you HORIZONTAL information and Repeat as giving you VERTICAL information. Some stitch dictionaries provide only charts. For this chart the "Multiples" are shown as separate from the "Plus 2" by dark lines. In patterns for garments the designers have figured out the multiple and repeat information for you but it is usually provided, either in preliminary information or in chart format. Each publication and individual designers present this information in different formats which contributes to the confusion. The examples used above are very simple ones. It is fairly easy to use stitch patterns of this type in patterns or to translate to chart format. Not all stitch patterns you find will be so easy. The project I am working on is an example of that type. Salon will be on Saturday even though there is a football game. Since I am teaching the finishing course on Sunday, I had no choice. Sorry Sports Fans! I've been working on the linen stole for the Spring Issue of Cast On. I fell in love with this yarn at TNNA. It is Shibui/linen. I wasn't sure what size needle to use so I did a gauge swatch. Notice I practice what I preach. 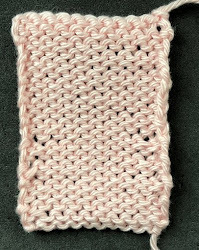 The top swatch was worked on Size 5 needles and the bottom one on Size 4. I liked the larger size better. One thing I like about this lace pattern is that it is reversible which makes it ideal for the stole. I've used this stitch pattern before. It is from one of Barbara Walker's books. I've made slight modifications to it. It is an excellent example of a more complicated stitch pattern. The REPEAT is 24 rows. The MULTIPLE is 12 but the Plus is the problem. Technically, it is 3. 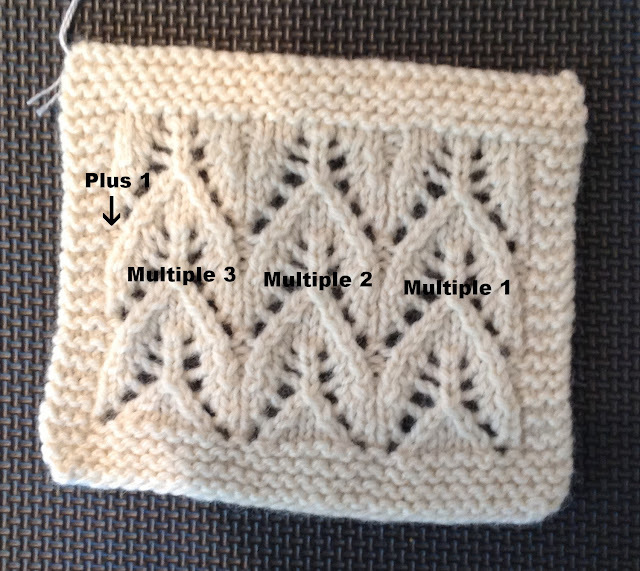 Usually the Plus is added at the end but in this case, 2 of the stitches are worked BEFORE the multiple. Due to the way the increases and decreases at the beginning and end of the pattern are worked, you actually have to work the last two stitches of the pattern differently. Writing patterns for stitch patterns of this type are always challenging. I've worked up a preliminary chart using Walker's as a guide but it needs some editing to make it easier for another knitter to use. Here is the stole so far. 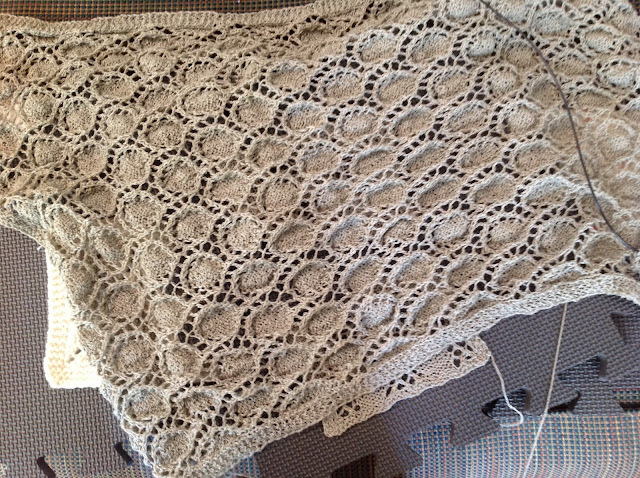 It will look better when blocked. Are you selling this pattern anywhere?